Most exercise training studies are short term. This is due to variables such as funding, subject compliance, subject retention, etc. Usually we see studies lasting 6 weeks, 10 weeks, 12 weeks, rarely longer. The longest I’ve seen may have been 26 weeks. The study I will be discussing is a cross sectional study. In order to be included in this study, subjects had to participate in their respective activities between 12 to 17 years. This study compared 5 different groups: 1. young control subjects, 2. older sedentary subjects, 3. older runners, 4. older swimmers, and 5. older strength trained subjects. The researchers performed muscle performance test and examined muscle biopsies. What does this physiology technical speak mean? According to the muscle biopsies of the older strength trained subjects, the tissue showed no aging. The tissue samples were “IDENTICAL” to those of the younger subjects. This was not the case with the other exercise groups, running and swimming. How and why does this occur? While muscle hypertrophy is multifactorial, the vast majority of the research I have reviewed suggest that microtrauma is one of the main variables necessary to stimulate a net increase in contractile proteins. Microtrauma is microscopic damage to the contractile proteins, non-contractile cytoskeletal proteins, tethering proteins, plasmalemma, etc. This microscopic damage is followed by a localized inflammatory response, which is necessary to clear away any injured or necrotic tissue in oder to promote new tissue growth. 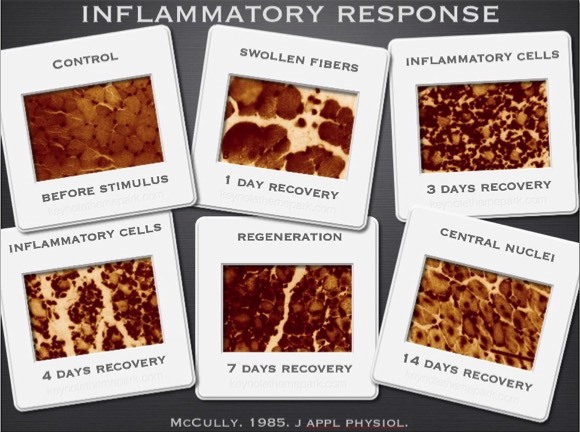 The slide demonstrates the inflammatory response. 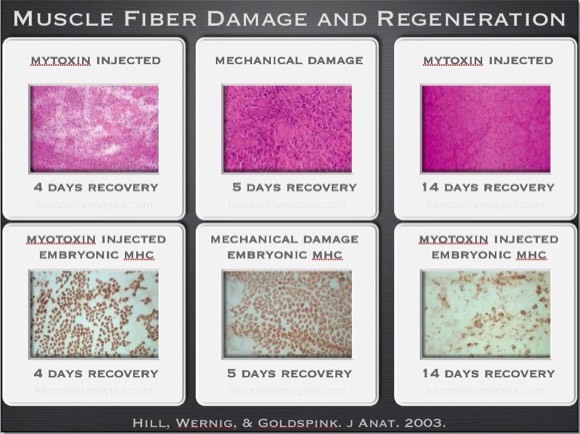 The next slide shows that when the muscle stains heavily for inflammation, it also stains heavily for embryonic myosin heavy chains. Embryonic myosin heavy chains are new contractile proteins, the same tissue found in a developing embryo. The new tissue has not yet matured or taken on a type. The muscle is being rebuilt with new proteins. One of my clients calls this internal exfoliation.